I'm going to be all over this one. During the week preceding Mother’s Day (May 10th), Bond No. 9 aficionados are invited to sign up their favorite mother for a unique Mother’s Day raffle gift: a year’s supply of Bond No. 9. This means one bottle per month of the eau de parfum of her choice. All you need to do is stop at any of the Bond no. 9 stores or at the Bond no. 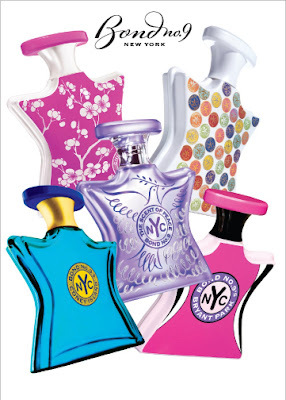 9 counter at Saks Fifth Avenue, Sunday, May 3rd - Saturday, May 9th. There you can supply their name and contact information on a raffle to be left in a hatbox. At the close of business on the 9th, the winning raffle at each store will be drawn at random and the winner informed that evening—just in time for Mother’s Day. Who qualifies as an eligible mother? The regular, old-fashioned, all-forgiving, chicken-soup mother, to be sure. But also the career mother, the vamp mother, the shopaholic mother … any female on whom we’d ordinarily bestow a Mother’s Day gift. And hey, self-satisfying types are welcome to enter their own name.